Scenes from the life of Milarepa, from an 18th-19th century Tibetan painting. The life of Milarepa is one of Tibet's most beloved stories. Preserved orally for centuries, we cannot know how much of the story is historically accurate. Even so, through the ages, Milarepa's story has continued to teach and inspire countless Buddhists. Milarepa was likely born in western Tibet in 1052, although some sources say 1040. His original name was Mila Thopaga, which means "delightful to hear." He is said to have had a beautiful singing voice. Thopaga's family was wealthy and aristocratic. Thopaga and his little sister were the darlings of their village. However, one day his father, Mila-Dorje-Senge, grew very ill and realized he was dying. Calling his extended family to his deathbed, Mila-Dorje-Senge asked that his estate be cared for by his brother and sister until Milarepa came of age and married. Milarepa's aunt and uncle betrayed their brother's trust. They divided the property between them and dispossessed Thopaga and his mother and sister. Now outcasts, the little family lived in servant's quarters. They were given little food or clothing and made to work in the fields. The children were malnourished, dirty, and ragged, and covered with lice. The people who once spoiled them now ridiculed them. When Milarepa reached his 15th birthday, his mother tried to restore his inheritance. With great effort, she scraped together all of her meager resources to prepare a feast for her extended family and former friends. When the guests had gathered and eaten, she stood up to speak. Holding her head high, she recalled exactly what Mila-Dorje-Senge had said on his deathbed, and she demanded that Milarepa be given the inheritance his father had intended for him. But the greedy aunt and uncle lied and said the estate actually had never belonged to Mila-Dorje-Senge, and so Milarepa had no inheritance. They forced the mother and children out of the servants' quarters and into the streets. The little family resorted to begging and transient work to stay alive. The mother had gambled and lost everything. Now she seethed with hatred of her husband's family, and she urged Milarepa to study sorcery. "I will kill myself before your eyes," she told him, "if you do not get vengeance." So Milarepa found a man who had mastered the black arts and became his apprentice. For a time, the sorcerer taught only ineffectual charms. The sorcerer was a just man, and when he learned Thopaga's story — and verified it was true — he gave his apprentice powerful secret teachings and rituals. Milarepa spent a fortnight in an underground cell, practicing the black spells and rituals. When he emerged, he learned that a house had collapsed on his family while they were gathered at a wedding. It crushed all but two — the greedy aunt and uncle — to death. Milarepa thought it right that they survive the disaster so they would witness the suffering their greed had caused. His mother was not satisfied. She wrote to Milarepa and demanded the family's crops be destroyed, also. Milarepa hid in the mountains overlooking his home village and summoned monstrous hailstorms to destroy the barley crops. Villagers suspected black magic and angrily stormed into the mountains to find the perpetrator. Hidden, Milarepa overheard them talking about the ruined crops. He realized then that he had harmed innocent people. He returned to his teacher in anguish, burning with guilt. In time, the sorcerer saw that his student needed a new kind of teaching, and he urged Milarepa to seek out a dharma teacher. Milarepa went to a Nyingma teacher of the Great Perfection (Dzogchen), but Milarepa's mind was too turbulent for Dzogchen teachings. Milarepa realized he should seek another teacher, and his intuition led him to Marpa. Marpa Lotsawa (1012 to 1097), sometimes called Marpa the Translator, had spent many years in India studying with a great tantric master named Naropa. Marpa was now Naropa's dharma heir and a master of the practices of Mahamudra. Milarepa's trials were not over. The night before Milarepa arrived, Naropa appeared to Marpa in a dream and gave him a precious dorje of lapis lazuli. The dorje was tarnished, but when it was polished, it shone with brilliant radiance. Marpa took this to mean he would meet a student with a great karmic debt but who would eventually become an enlightened master who would be a light to the world. So when Milarepa arrived, Marpa did not offer him the beginning empowerment. Instead, he put Milarepa to work doing manual labor. This Milarepa did willingly and without complaint. But every time he completed a task and asked Marpa for teaching, Marpa would fly into a rage and slap him. Among the tasks Milarepa was given was the building of a tower. When the tower was nearly finished, Marpa told Milarepa to tear it down and build it somewhere else. Milarepa built and destroyed many towers. He did not complain. This part of Milarepa's story illustrates Milarepa's willingness to stop clinging to himself and place his trust in his guru, Marpa. Marpa's harshness is understood to be a skillful means to allow Milarepa to overcome the evil karma he had created. At one point, discouraged, Milarepa did leave Marpa to study with another teacher. When that proved to be unsuccessful, he returned to Marpa, who once again was angry. Now Marpa relented and began to teach Milarepa. To practice what he was being taught, Milarepa lived in a cave and devoted himself to Mahamudra. It was said that Milarepa's skin turned green from living only on nettle soup. His practice of wearing only a white cotton robe, even in winter, earned him the name Milarepa, which means "Mila the cotton-clad." During this time he wrote many songs and poems that remain jewels of Tibetan literature. Milarepa mastered Mahamudra teachings and realized great enlightenment. Although he did not seek out students, eventually students came to him. Among the students who received teachings from Marpa and Milarepa was Gampopa Sonam Rinchen (1079 to 1153), who founded the Kagyu school of Tibetan Buddhism. 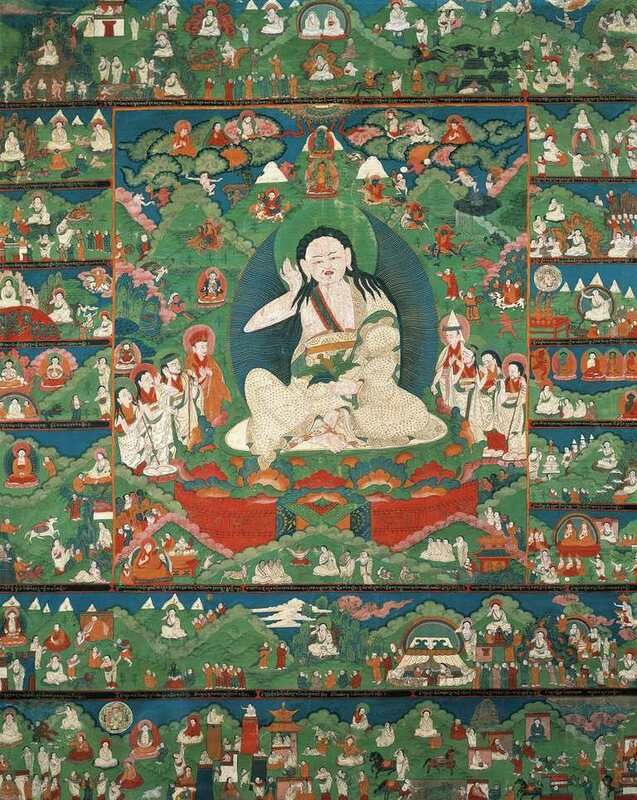 Milarepa is thought to have died in 1135.